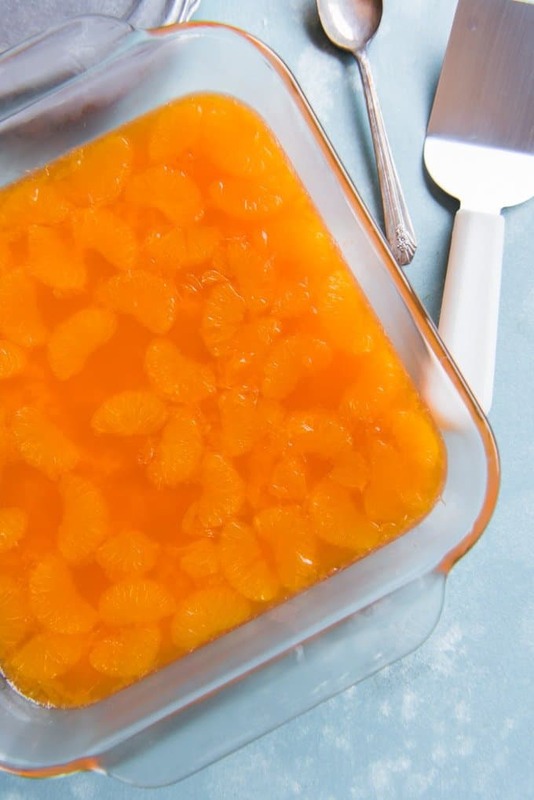 This Orange Jello Salad is a retro throwback dessert that tastes like creamsicles in Jello form with a sweet, creamy topping and a sweet-tart layer of orange gelatin, mandarin oranges, and orange juice concentrate! 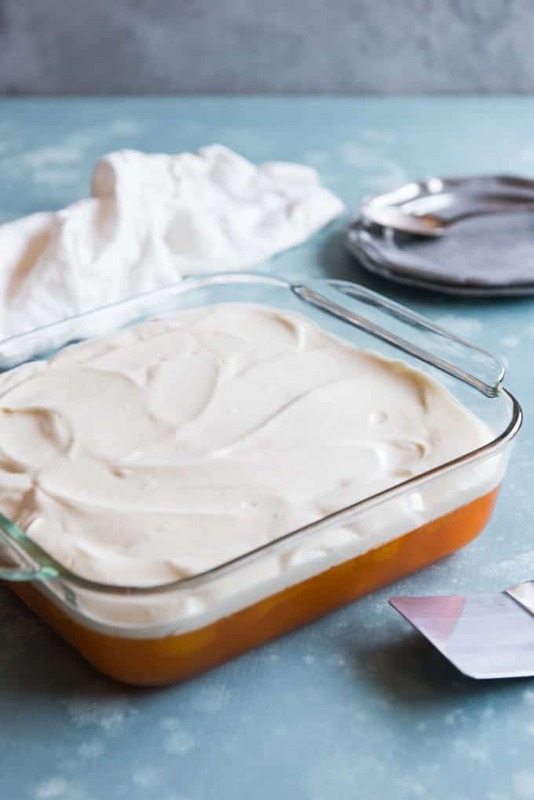 Orange Jello Salad is one of our favorite summer treats (even though we eat it year round!) and everybody loves when you show up at a potluck or picnic or reunion carrying it! It’s no secret that I love a good Jello. I mean, how can you resist these delicious, kitschy, vintage desserts! I’ve already posted about Lemon Pineapple Jello with Pineapple Whipped Cream Topping and my Triple Layer Christmas Jello Salad. But today I’m coming at you with another fantastic Jello concoction that has been one of my favorite treats since I was a kid. 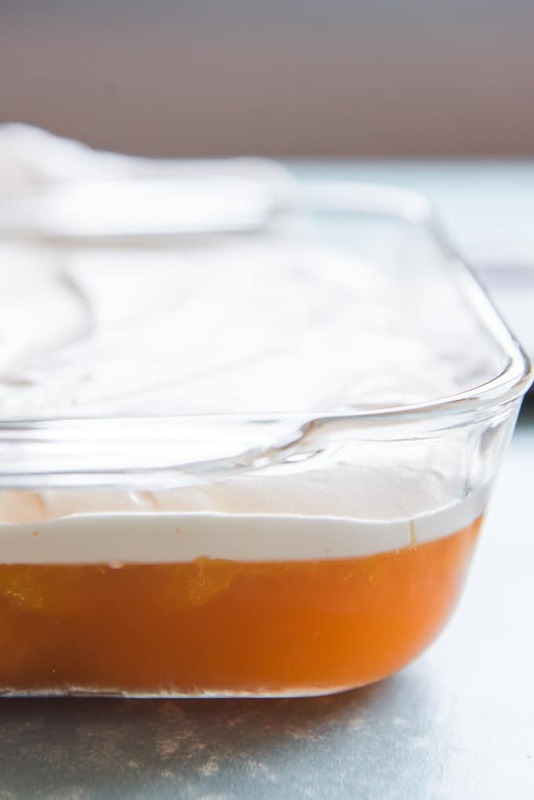 It’s this perfectly delightful Orange Jello Salad with Pudding Whipped Cream that is reminiscent of the creamsicles that were always in my grandparent’s freezer, and summertime and potlucks! Calling it a salad serves no other purpose that I’m aware of other than to justify serving this sweet, citrusy stuff at the same time as the rest of dinner. It’s basically the only time I remember being allowed to eat dessert first if I wanted to as a kid. Annnnnd as an adult. Just sayin’. The tart & tangy orange layer on the bottom is made with orange gelatin, orange juice concentrate, mandarin oranges, and some of the juice from the cans of mandarin oranges in place of some of the water called for on the package of Jello. 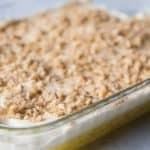 The top layer is a fluffy, dreamy pudding and whipped cream concoction that is sweet and light and pairs perfectly with the tart and tangy bottom layer. 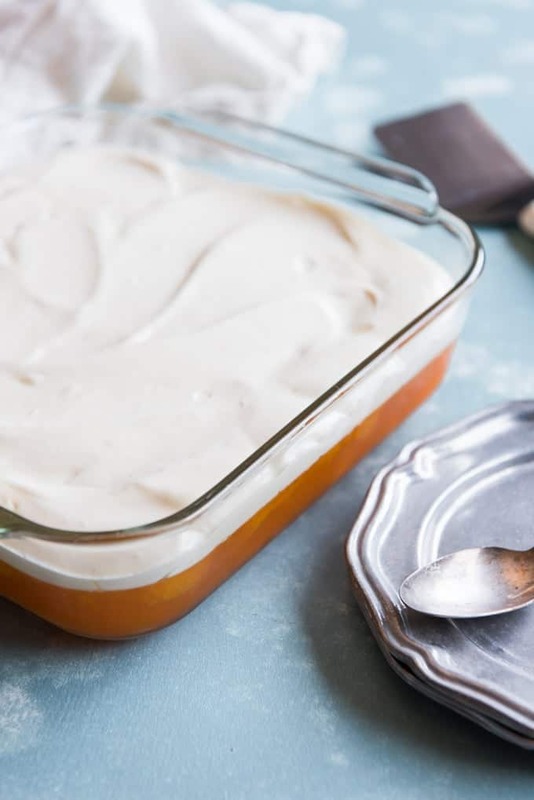 You can use vanilla or french vanilla pudding, but just make sure that it is the instant kind, not the cook and serve variety. The whole thing is cool and refreshing and just the perfect treat year round, but especially in the summertime. And anyway, there’s always room for Jello! Be sure to sign up for the House of Nash Eats emails so you never miss a recipe! Dissolve the Jell-O in the hot water by stirring until crystals are no longer visible. Add the frozen orange juice concentrate and stir until completely melted. Add the juice from one of the cans of mandarin oranges, then stir in the oranges from all three cans. Pour into a large glass dish and transfer to the refrigerator to chill until completely set, about 4 hours. Combine the instant vanilla pudding mix and cold milk in a bowl and whisk well until it starts to set up, about 1-2 minutes. Note that this recipe does not use the same amount of milk as directed on the package of pudding. 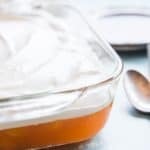 Fold in the Cool Whip or whipped cream, then spread over the top of the set Jell-O. I used to love creamsicles so anything that reminds me of them just has to be good. 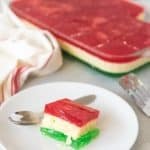 I haven’t made a jello salad in a while, I used to make one with lime and cream cheese, but this one just might make me find my old molds and make another one. Thanks for bringing back the memories. Hi Amy! You’ve got some great tips! I’d never thought of adding pudding to the whipped cream before. Spreading straight-up Cool-Whip on top of the jello works too, but I’ll definitely have to give your version a try! This is adorable and I bet sooo good! Love that orange color and the two textures play well together in a delicious mouthful. Love the addition of the pieces of mandarin oranges inside this dessert. It’s so vibrant! You could probably leave the oranges out, though, right? Absolutely, if you don’t like the texture of them. This yummy Jello salad was a huge hit at our family get together this past weekend! Everyone wanted the recipe. It reminded us of the orange jello salad my grandmother used to make. It was a definite conversation starter that led to laughter, smiles and beautiful walk down memory lane. This reminds me of my childhood! I love jello salad! So simple and so, so good! I love the added oranges in the bottom and the cool whip top is so yummy! 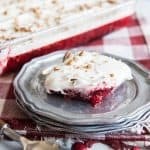 A perfect easy dessert for any occasion! As written this is for a 9×13-inch rectangular pan.